2015 will be the year of Cluj-Napoca, the city in the heart of Transylvania that has just become “European Youth Capital” of this year – and its AEGEE antenna will be involved in a very active way throughout this project, as Raluca Radu, President of AEGEE-Cluj-Napoca, explains. If you have been an AEGEE member for some time, you must have heard before about this city, as it is home to one of the most active AEGEE locals in the Network. Cluj-Napoca, the second major city in Romania, is just over 400 km away from the capital Bucharest, but also other European capitals such as Budapest or Belgrade. It is probably the biggest student city in Romania: out of a population of around 400,000 inhabitants, more than 60,000 of them are students, since it hosts several universities and academic centers. It is therefore one of the cities with the most foreign students in Romania, which makes it a very dynamic and multicultural city – and, what’s more, local inhabitants are positive about it. According to a 2013 survey of the European Commission, 91% of people in Cluj-Napoca think that the presence of foreigners is good for the city. But you might be wondering – what is exactly a European Youth Capital? It is an award given by the European Youth Forum (YFJ) every year to one European city, in order to show and strengthen its youth-related cultural, social and leisure aspects, and to foster the cooperation between European and local institutions. Since it was created, in 2009, these European Youth Capitals have launched several projects in terms of youth engagement and local participation in society – therefore, this means that Cluj-Napoca’s streets will be filled of projects, events and initiatives that will boost youth participation in the city’s cultural and social life. 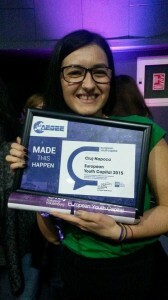 In December 2012, Cluj-Napoca was selected as this year’s European Youth Capital by the YFJ. The candidature was driven by the ‘Share Federation’, which gathers 36 youth organisations from Cluj-Napoca. Representatives from each organsiation meet twice a month to discuss several aspects related to youth associative culture. This federation will be the one in charge of coordinating all the activities that will take place throughout the year. Therefore, it is no surprise that the theme of Cluj-Napoca’s Year as European Youth Capital is “share”: sharing cultural and inter-generational diversity, the culture and customs of the city and enhancing friendship and understanding between Europe’s young people. Moreover, our antenna in the city contributed to Cluj-Napoca’s candidature from the very start: “AEGEE-Cluj-Napoca is one of the founding members of the Share Federation, so we wanted to be involved in this even before we knew the city was going to win this title”, explains Raluca Radu, President of AEGEE-Cluj-Napoca. The involvement in the candidature started back in 2011, lead by the former president of the antenna, Anca Gliga, and was followed by Ioana Duca, current Financial Director of AEGEE-Europe and President of AEGEE-Cluj-Napoca in 2012, who told The AEGEEan that she was in charge of collecting the signatures and letters of support to make the Share Federation happen and, as a result, Cluj-Napoca’s candidature as European Youth Capital. AEGEE-Cluj-Napoca has lately been focused in organising European events, so there will be many lucky AEGEEans that will get to discover the brand new European Youth Capital with them, ranging from the Summer University Project School, from 5th to 12th March, to their Summer University in August. However, they also plan several local events: “we are organising a graffiti event, called GRAFFITIart Youth @ Cluj-Napoca 2015, in cooperation with a dear company of ours from Cluj-Napoca, and we want to involve not only our members, but the entire community. With this event, which will take place in May, we want to make the city more colorful and happier. Other that this, we also would like to cooperate with all the youth organisations from Cluj-Napoca in organising something big and nice!”. So stay tuned for what it is about to come! We asked Raluca about which places in the city she would recommend: “well, the city itself is full of culture and history. The medieval part of the city is simply great – it’s located two minutes away from the city centre, and when you get there, it’s like you are in a different world. But I will let you discover more when you come to Cluj-Napoca this year!”. When you get to the city, one of the first things you will see is surely Matthias Corvinus on his horse in front of the Gothic style St.Michael’s Church, one of the most famous sights of Cluj-Napoca, located in the city’s main square, Piața Unirii (Union Square). In the past New Year’s Eve, the city got totally crowded by thousands of young people who celebrated the beginning of this promising year for the city. Then, take a walk around the Heroes’ Avenue (Bulevardul Eroilor), one of the most vivid and colourful spots in the city. Get lost in its Central Park, which is absolutely every bit as beautiful as some of the most famous parks in Europe, with its windmills on the trunks, the cute and small bridges, the large lakes and sculptures. And make sure you don’t miss Cluj-Napoca’s fortress hill at night – the astonishing views and the city lights will surely amaze you. Looking forward to getting to know the brand new European Youth Capital? 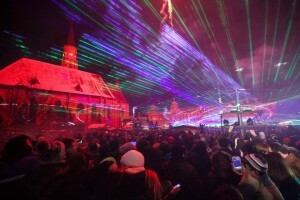 For 2015, it is counted that there will be over 1,500 events and happenings in Cluj-Napoca throughout the year – you have no excuse to miss it! You have time until the end of the year, when Cluj-Napoca will pass the torch to Gəncə (Azerbaijan), the awarded European Youth Capital of 2016.